The long jump has a relatively long Olympic history for a women’s event and has featured some of the world’s greatest athletes in the sport. The Rio event looks wide open and British success looks feasible based on Shara Proctor’s superb silver in the Beijing World Championships. And it isn’t a single-pronged attack as both Lorraine Ugen and Katarina Johnson-Thompson are also potential medallists. USA should have the strongest team with five jumpers over 6.93m last summer, including world champion Tianna Bartoletta and defending champion Brittney Reese. The first women’s Olympic champion was Hungary’s Olga Gyarmati. Her mark was more than 55 centimetres down on absent world record-holder Fanny Blankers-Koen’s 6.25m. The Dutch athlete nevertheless won four golds in London though. The world record only just survived in Helsinki in 1952 when New Zealand’s Yvette Williams won with 6.24m. It was especially noteworthy as she fouled her first two jumps and needed a ‘do or die’ third jump of 5.90m to qualify for the top eight. Williams also finished in the top 10 in shot and discus and runner-up Aleksandra Chudina was even more versatile, winning silver at long jump and javelin and a bronze in the high jump. However, it was widely believed the masculine-looking Soviet, who was also a champion speed skater and volleyball player, would not have passed any gender tests had they been in existence. The clear winner in Melbourne in 1956 was Poland’s Elzbieta Krsesinska, who equalled her own world record of 6.35m. A distant second was 17-year-old Willye White of the USA. In Rome in 1960, the Pole was expected to battle with new world record-holder Hildrun Claus or Britain’s Mary Bignal, who headed qualifying with 6.34m. However, the gold surprisingly went to Soviet Vera Krepkina, who was joint world record-holder in the 100m. The 11.3 sprinter won with 6.37m with Krsesinska second and Claus third. That 6.37m would have only been good enough for fifth in 1964 in Tokyo (see ‘British successes’ below) and outside the top eight in the altitude of Mexico in 1968. Romanian Viorica Viscopoleanu had been fifth in 1964 but, aided by the altitude in South American city, improved her PB from 6.54m to a world record 6.82m. Germany’s Heide Rosendahl was eighth in Mexico but was world record-holder by the time of Munich in 1972. She coped with the pressure of being a home favourite well and won with 6.78m, though ultimately she won gold by just a centimetre as Bulgaria’s Diana Yorgova made a huge improvement in second. In Montreal in 1976, gold was won, for the third Games running, with a first-round jump. This time it was via a 6.72m from Angela Voigt, who had briefly held the world record earlier before losing it to Siegrun Siegl, who was fourth before winning gold in the pentathlon a few days later. Seven metres was breached in the Olympics for the first time in Moscow in 1980 , but the standard was not as high in Los Angeles in 1984. The Soviet boycott didn’t stop Romania competing and their world record-holder Anisoara Stanciu won with a 6.96m, almost half a metre down on her 7.43m record. Jackie Joyner-Kersee was only fifth but she set an Olympic record of 7.27m in winning gold in the heptathlon. In the final, the 1983 world champion Heike Daute led from the third round with 7.18m and then jumped 7.22m in the fourth. However, the American responded with a huge Olympic record 7.40m. Daute, better known under her married name of Drechsler, would have won gold in every other long jump before or since with her 7.22m. Joyner-Kersee’s distance would have won a medal in the men’s long jump in 1952. The American won gold again in the 1991 World Championships but failed to make it four global titles in a row in Barcelona. Drechsler, who admitted to enforced drug-taking in her GDR era, narrowly won with 7.14m as Inessa Kravets and Joyner-Kersee were within five centimetres of her. The surprise winner in Atlanta in 1996 was Chioma Ajunwa. The accomplished football player – she played for Nigeria in the 1991 World Cup – failed a drugs test in 1992 and returned just in time from her four-year ban to win gold in America with 7.12m. She became Nigeria’s first women’s Olympic champion and the first African woman jumper to win gold. Joyner-Kersee won her third medal, this time a bronze. Drechsler had missed the 1996 Games with injury and was also absent from the 1999 World Championships. However, she was fit and healthy for Sydney in 2000 and regained the title with 6.99m. Most of the media attention had been on Marion Jones, who had won a sprint double, but she could only finish third, and she later lost the medal due to her admitted drug-taking. In 2004 in Athens, just two centimetres covered the three medallists with double world triple jump champion Tatyana Lebedeva making up for her disappointing third in her supposed speciality in Greece with a 7.07m victory. It was the first women’s clean sweep since Moscow’s Soviet-dominated 1980s 800m and pentathlon. Lebedeva just missed out on defending her title in Beijing in 2008 as Brazil’s Maurren Maggi won by a single centimetre. Brittney Reese, who won the World Championships in 2009, 2011 and 2013, took the Olympic title in London in 2012 with a leap of 7.12m. The boycott kept away many Western nations such as USA and Germany, but it didn’t affect the quality too much in Moscow, which saw unprecedented long jumps. The Soviet team was strong, even without Vilma Bardauskienne, who had been the first to breach seven metres but couldn’t make their team. At the start of the final round, the Soviet Tatyana Skatchko led with a jump of 7.01m, with East Germany’s Brigitte Wujak second with 6.88m and Poland’s Anna Wlodarczyk third with the same distance and Soviet Tatyana Kolpakova fourth on 6.87m. Wlodarczyk was delighted when she went second with a 6.95m final jump as she thought that had guaranteed a medal. However, Kolpakova smashed her PB with her last jump to go into the lead with 7.06m, Wujak also decimated her PB and snatched silver with 7.04m and the Pole had to settle for fourth. Britain’s first medal came in 1952 when Shirley Cawley gained a bronze. Mary Rand then became Britain’s first women’s Olympic athletics champion in 1964. She had been a medal hopeful in 1960 but after leading qualifying, finished ninth when her qualifying jump would have placed her second. She again led qualifying in 1964 but this time was even better in the final and won easily with a world record 6.76m. Even her sixth-best jump would have won the silver medal. That went to Irina Kirzsenstein, who under her married name Szewinska became one of the greatest women athletes in history, winning 400m gold in 1976. Britain won another medal in 1968 when Sheila Sherwood excelled to take second. Sue Hearnshaw, who is still competing as a master, was the fourth and most recent British medallist. 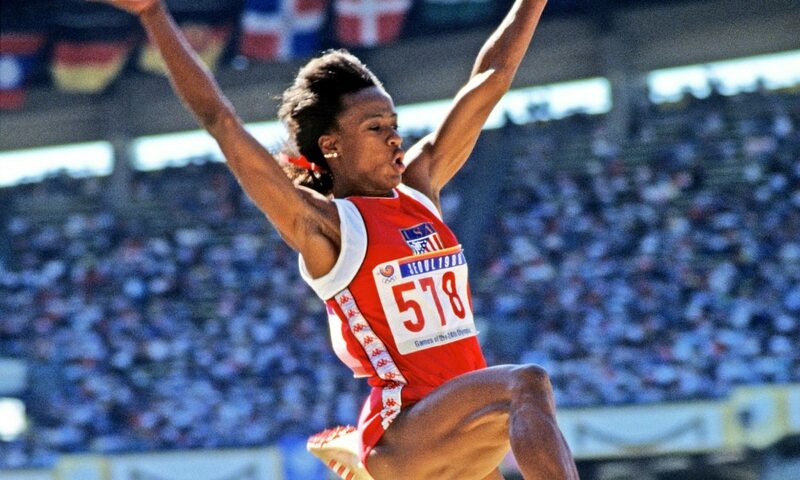 She finished third with a windy 6.80m in Los Angeles in 1984, although her job was made easier by the Soviet boycott. There was one more British-born medallist though. Fiona May was sixth for Britain in Seoul in 1988 but married an Italian and won silver for her new country in 1996 and 2000.